Jim Rinehart, a good friend helped us finish Blue Diamond and got the bug !!!.... 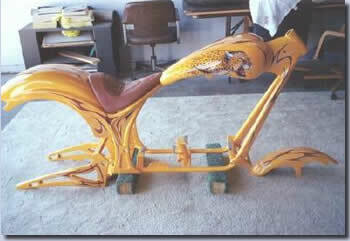 Here are a few shots of the Huze/Penz based bike that has been turning heads since he finished it in October of 2001.. Above is the mockup stage. It has a Total Performance 107 CI Motor, Polished up as it should be, Duece front forks, a set of one-off handlebars designed by Jim himself, some Beautiful PM Wheels and brakes, and a 240MM Rear that finishes off this wild piece!! Check out the pipes he had specially bent just for this ride. Jim was inspired and although we helped with the things he could not do, we basically let him loose in the shop to cut & grind and drill (did he ever grind!) as he sculpted this hunk of metal into this unique ride you see before you just after Chris Cruz got done doing his graphic thing on it!!! Custom metal is an understatement! The tag Bracket, bolted to an extension of the rear swingarm, The Speedo, built into the handlebars by Mitch Bergeron, the fender supports, molded into the rear fender like it was carved from a hunk of steel! The list is long and so was the build time... Jim & I agree, the effort has been worth it! Notice the back end of this fender... the triangular shaped red spots are the taillights... Dead flush, complete with LED signals... Very Nice!!! There is nothing on this bike, that resembles anything close to stock... 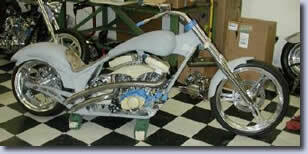 The battery Rides on the swingarm, there is no seatpost at all, etc., etc. Below you can see the happiest 60 year old on the planet! 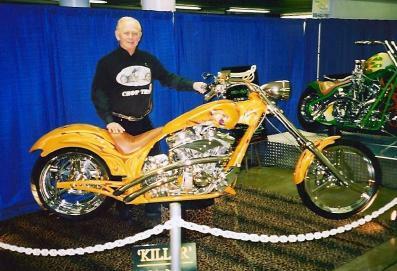 The shot is from the Columbus Easyriders Show, where although he missed a trophy, it was standing room only for pictures and autographs from Jim!! !